A man suspected of dousing his wife with gasoline and setting her on fire as they drove on a Corona freeway is set to appear in court next week. Constantino Monterrosas Gamez, 39, of Santa Ana, will be officially charged with attempted murder. On July 15, Gamez got into a dispute with his 23-year-old wife before the crime, the California Highway Patrol said in a news release issued late Wednesday. The pickup was traveling on Interstate 15 at 65 to 70 mph, when the woman, who Gamez had set on fire with a cigarette lighter, opened the door and jumped out, the CHP reported. She suffered serious injuries as she hit the pavement but was not hit by vehicles. 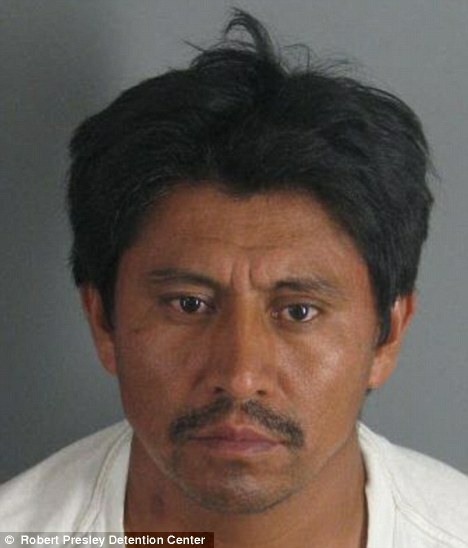 Gamez was booked into the Robert Presley Detention Center in Riverside, the CHP said. His bail was set at $1 million. His arraignment is set for Thursday. Riverside County Superior Court records indicate that in addition to attempted murder, Gamez has been charged with kidnapping, making criminal threats and false imprisonment, all felonies. He also faces sentencing enhancements of using a firearm in the commission of a serious felony and gross bodily injury involving domestic violence. The CHP said Gamez and his wife, a Santa Ana resident whose name was not released, were in a 2002 Chevrolet S-10 pickup, traveling about 8:15 a.m. south on I-15 just north of Temescal Canyon Road when they got into a dispute. Gamez continued driving south on the freeway but somehow lost control of the pickup, slamming into the back of a garbage truck. CHP officers arrived and took Gamez into custody. Neither he nor the garbage truck's driver was hurt in the collision. Officer Sylvia Vargas, spokeswoman for the CHP's Riverside office, said the woman's injuries were listed as major due to the burns. She was taken to Riverside County Regional Medical Center in Moreno Valley and is expected to recover. Gamez passed a sobriety check at the time of his arrest, Vargas said. If convicted of attempted murder, Gamez could be sentenced to life in prison with the possibility of parole, according to section 664 (a) of the California Penal Code. Anyone who might have witnessed the incident is asked to call CHP investigators Daniel Perez and William Bozyk at 951-637-8000. What is world coming to if you can light a lippy dame up. Let me see, he's 39 and she's 23. I bet they've been married for 12 years. Go light your wives on fire in your own country.....maaaaannnnn!